If you haven't heard of these, you need to go get some...now! The kids LOVE them and they can be used by the teacher for circling sight words, etc. in big books. I bought a big box from Lakeshore Learning and the stixs came maybe 20? of the same color stuck on a plastic sheet. My students took a sheet of one color to their desk with a sight word ring or laminated list. They made their sight words by twisting the stixs into letters. I trained my students in the beginning of the year to take VERY good care of them since they are not as cheap as you would think for string covered in wax! 2. They must be straightened out and placed back on the correct colored plastic sheet and put back in the Sterilite drawer. They are still in excellent shape so I do not plan to buy any for this year. I love Wikki Stix! In the past, I've used them to circle sight words, adjectives, or other important words on class poetry charts. The kids think they are awesome! I love wikki stix! I would have my kids make their sight words, then do a crayon rubbing of the words, which I then used as their recording sheet/assessment. So much fun! I love wikki stix. They last a lot longer than you think. I had my set for four years! 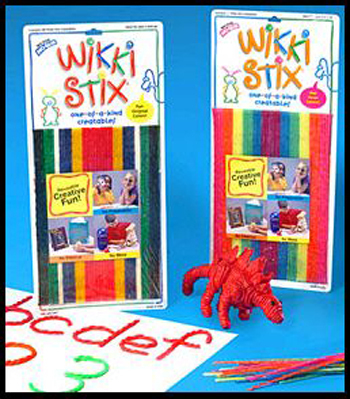 I love using wiki stix in the classroom, my secret though, is off brand! I bought I believe a package of 160 stix in about 15 different colors from JoAnn's for $10...can't beat that! And my kids love to use them for spelling words in class!